From mortal enemies to unexpected allies, two teenagers try to protect everything that matters most. Ella Harper has met every challenge that life has thrown her way. She’s tough, resilient, and willing to do whatever it takes to defend the people she loves, but the challenge of a long-lost father and a boyfriend whose life is on the line might be too much for even Ella to overcome. Reed Royal has a quick temper and even faster fists. But his tendency to meet every obstacle with violence has finally caught up with him. If he wants to save himself and the girl he loves, he’ll need to rise above his tortured past and tarnished reputation. No one believes Ella can survive the Royals. Everyone is sure Reed will destroy them all. With everything and everyone conspiring to keep them apart, Ella and Reed must find a way to beat the law, save their families, and unravel all the secrets in their Twisted Palace. This has been an incredible reading week and I have had an incredible run of very different yet amazing reads in their own right. 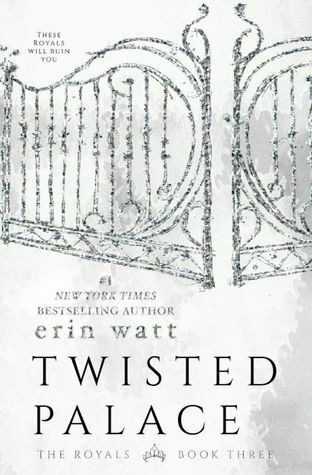 This series has been a guilty pleasure, I love my college romances, I love living vicariously through these teenagers as they live a life I never had and I have soaked up every word, every situation and every plot twist. While this has ultimately been Ella and Reed’s story the shenanigans going on at the Royal house has kept the pace of this series running at the rate of knots and it certainly doesn’t let up in Twisted Palace…hang on for the ride! The tag line for this series is “The Royals will ruin you” and that certainly continues in Twisted Palace. After the ending of Broken Prince, I was aghast, I mean how could they leave it there for starters and two how the hell was this one going to be explained. It is all doom and gloom for Reed in this book, even though he is seemingly innocent the evidence against him is condemning, how could an innocent man look so guilty…unless he wasn’t? I had so many theories, but no matter where my thought processes went, I was always wrong. The situation is untenable, but Reed, being Reed stepped up to the plate, to make the ultimate sacrifice when all Ella wanted to do was run. Ella was a “runner” first and foremost, but with Reed behind her she couldn’t get very far. As much as she wanted to run, Reed pulled her back. This was the biggest test of their relationship and watching them battle through as a team was beautiful to witness. This makes them stronger, but not only them, the Royal’s as a whole pull together. A family decimated through grief finally pull together to protect and support one of their own. Ella may be their “princess” but one thing she has done is brought these men together, made them stronger, made them a family once again. Ella now has a family; the Royals are fiercely protective of their women but it seems the rest of the world wants to tear them apart. Is this a crisis that even the Royal reputation and money can’t worm their way out of? I have adored this series from the very first page of Paper Princess to the last of Twisted Palace, but I feel that this is just the tip of the iceberg. This may be the conclusion to Ella and Reed’s story but there are a lot of Royal men that need their story to be told. Gideon has been the biggest enigma, I am desperate to know what makes this elder Royal tick, how he got himself into the situations he did and now, after the aftermath, what is to become of him. The twins story is certainly going to be fun, these two are inseparable in life and love…a YA ménage? Easton, the joker, yet so troubled, he needs to be calmed down a little, maybe love is just what he needs. Now I am showing my age though, I am desperate for the silver fox’s story, Callum. This man, my heart has broken for him on so many occasions and now the truth has finally been revealed maybe he can move on, he deserves it. 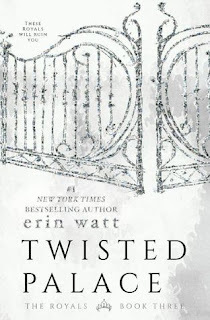 Erin Watt, the writing powerhouse, have brought us an unforgettable family, a family that I am not willing to leave, I only hope that the success of this trilogy spurs them on to continue my Royal romance. I love it when you get so invested, it is testament to the skill of the authors and this family have wheedled their way into my heart and head. While Twisted Palace was all sorts of crazy, it was a gripping intense crazy, an unpredictable crazy and I want more. Give me more crazy!!! !